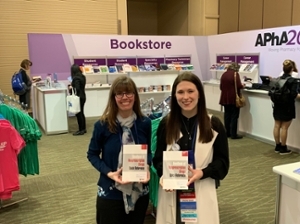 Southern Illinois University Edwardsville School of Pharmacy’s (SOP) Miranda Wilhelm, PharmD, along with co-editor Cortney Mospan, PharmD, introduced the newly revised “Handbook of Nonprescription Drugs Quick Reference” at the American Pharmacists Association (APhA) Annual Meeting held March 22-25 in Seattle. A clinical associate professor in the SOP Department of Pharmacy Practice, Wilhelm authored four chapters and co-edited the publication. Mospan is an assistant professor of pharmacy at Wingate University Levine College of Health Sciences in Indian Trail, N.C. She also serves as a clinical pharmacist with Dilworth Drug and Wellness Center. “The purpose of the ‘Handbook of Nonprescription Drugs’ is a comprehensive textbook that introduces the student pharmacist to nonprescription medicines and provides self-care faculty with a robust background for teaching,” Wilhelm said. “The Quick Reference is the next step in knowledge management and evolution. A similar book previously had been written, but the author chose not to continue. When Wilhelm and Mospan were the first to advise the original author about their interest in continuing the project, they became partners. They accepted the project and modified the format, so that it is a QuEST SCHOLAR MAC approach to chapters. QuEST SCHOLAR MAC is a systematic approach to patient assessment. It helps pharmacists to gather and evaluate information about the patient’s problem or symptom(s) and overall health, differentiate self-treatable conditions from those that require medical referral, and counsel the patient regarding the best treatment option, ranging from no treatment to over-the-counter medication to referral to a healthcare provider. A native of Garnett, Kansas, Wilhelm earned a doctorate of pharmacy in 2002 from the University of Kansas School of Pharmacy. Before joining SIUE in 2008, Wilhelm was pharmacy manager for Hen House Pharmacy in the Kansas City area. In that role, she was also primary preceptor for the University of Kansas/Hen House Pharmacy community pharmacy residency program. Wilhelm’s clinical specialty area is community-based pharmacy practice. She is the clinical community pharmacist with Schnucks Pharmacy in Edwardsville. Her interests include delivery of patient care services, medication therapy management, disease state education and self-care. Other areas of interest relate to health and wellness such as immunizations and preventative screenings. The “Handbook of Nonprescription Drugs Quick Reference” can be purchased at ebusiness.pharmacist.com. Photo (L-R): SIUE Edwardsville School of Pharmacy’s Miranda Wilhelm, with co-editor Cortney Mospan of Wingate University Levine College of Health Sciences.